Compact and clean are the featured strengths of this mini spacer. With a minimum of space, the MAFAC KEA offers high-end technology for a wide range of applications. Discover the numerous benefits of this compact single tank cleaning system, designed for decentralized use. 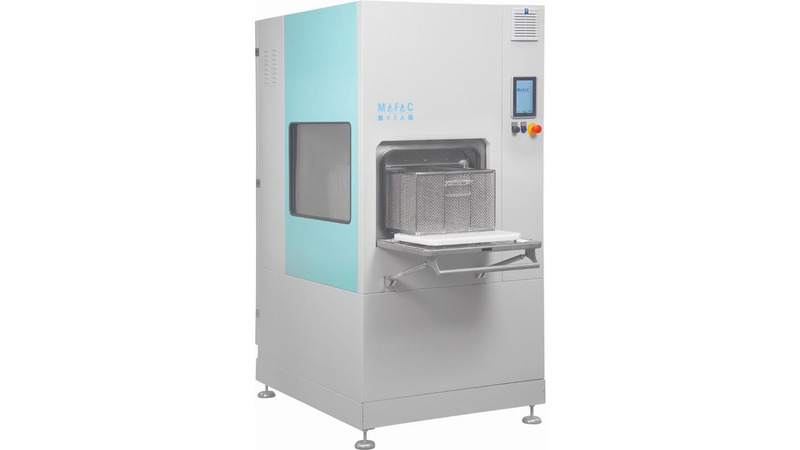 The basis for reliable cleaning results with the KEA is MAFAC&apos;s unique invention of the spray cleaning process with counter- or co-rotation of the holding basket and spraying frame. The special design of the spraying system including flat beam jets as well as full beam jets allows for impulsed on-the-spot cleaning of components and for surface cleaning. The cleaned parts are dried by a stationary hot air pulse blower system using two alternating pipes for the blowing process. Long and reliable bath life of the KEA is ensured by MAFAC&apos;s coalescing oil separation system, which utilises a floating suction device within the wash tank. For further enhancement, an additional fine filter can be installed, as an option, for removal of the smallest particles. Despite its space-saving design, the KEA&apos;s wash tank holds a considerable volume of 320 litres. Another userfriendly aspect is its reduced noise level. With figures of only 64 to 71dB(A) the system is exceptionally quiet.